If you want to understand better your own faith or to explore what Christians believe then studying the Bible is an essential activity. 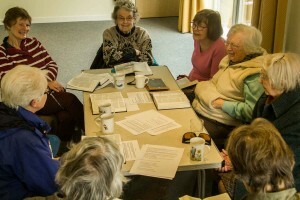 Coming along to the Ladies Bible Study Group is an opportunity to learn more, in a relaxed and friendly atmosphere, about the Christian faith and to understand how Christian beliefs relate to our contemporary world and culture. We meet every Tuesday morning at 10.30 in the church. Please come and join us. For more information please contact Elizabeth Smith on 01684 540093.